A lot of studies have been carried out on Saccharomyces cerevisiae, an yeast with a predominant fermentative metabolism under aerobic conditions, which allows exploring the complex response induced by oxidative stress. S. cerevisiae is considered a eukaryote model for these studies. We propose Kluyveromyces lactis as a good alternative model to analyse variants in the oxidative stress response, since the respiratory metabolism in this yeast is predominant under aerobic conditions and it shows other important differences with S. cerevisiae in catabolic repression and carbohydrate utilization. The knowledge of oxidative stress response in K. lactis is still a developing field. In this article, we summarize the state of the art derived from experimental approaches and we provide a global vision on the characteristics of the putative K. lactis components of the oxidative stress response pathway, inferred from their sequence homology with the S. cerevisiae counterparts. Since K. lactis is also a well-established alternative host for industrial production of native enzymes and heterologous proteins, relevant differences in the oxidative stress response pathway and their potential in biotechnological uses of this yeast are also reviewed. A lot of studies have been carried out on Saccharomyces cerevisiae, an yeast with a predominant fermentative metabolism under aerobic conditions , which allows exploring the complex response induced by oxidative stress. 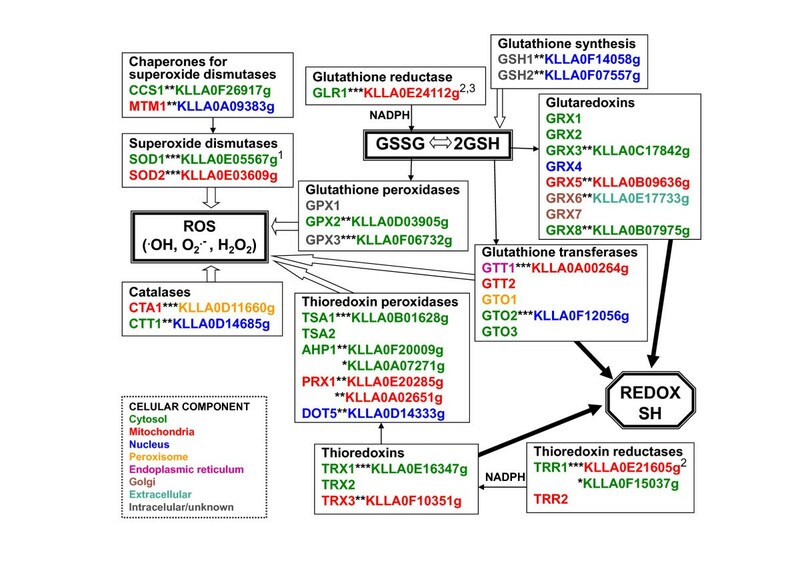 Recent reviews of different aspects of the oxidative stress response in S. cerevisiae have been published but the information about these complex regulatory networks in other yeasts is more limited [2–5]. Kluyveromyces lactis is a good model to analyse alternative variants in the oxidative stress response, since the respiratory metabolism in this yeast is predominant under aerobic conditions . A comparison of the transcriptomes of S. cerevisiae and K. lactis, growing in complete medium with glucose, using heterologous DNA arrays , revealed that the transcription of functional groups of genes related to housekeeping functions, such as mitosis, transcription or cell wall biogenesis, is highly correlated in both yeasts. However, large differences between groups of genes related to carbohydrate metabolism, respiratory functions and oxidative stress response have been found. Several connections between the alternative use of different metabolic pathways and oxidative stress have also been found. The way that sugar oxidation re-routing, carried out by different metabolic pathways, may influence the oxidative stress response is documented both in S. cerevisiae [8, 9] and K. lactis . The K. lactis rag2 strain, a mutant lacking the glycolytic enzyme phosphoglucose isomerase, grows in glucose, metabolising the sugar through the Pentose Phosphate Pathway (PPP) but this growth is avoided in the presence of Antimicyn A due to blockade of the mitochondrial respiratory chain after ubiquinone . In the rag2 mutant, the preponderance of the use of PPP over glycolysis causes an increase in respiration that restores NADP+ levels and allows the flow through PPP to continue . Growth of the rag2 strain PM5-2D in fructose is possible through glycolysis and it is not blocked by Antimicyn A . A moderate increase in mRNAs transcribed from several genes involved in the defence against oxidative stress was observed  when comparing the transcriptome of the rag2 mutant strain growing in glucose (through PPP) vs. fructose (through glycolysis). This confirms that the use of alternative metabolic pathways in the catabolism of sugars influences the oxidative stress response in K. lactis. It is also possible to find counterpart connections between oxidative stress and the alternative use of metabolic pathways. Hence, the onset of an oxidative stress response may open previously-blocked metabolic pathways. In S. cerevisiae, a mutant lacking phosphoglucose isomerase, pgi1, does not grow on glucose because the PPP is not fully operative. Growth on glucose of the pgi1 mutant is achieved by adding oxidizing agents such as hydrogen peroxide (H2O2) or menadione, thereby causing oxidative stress to yeast cells . 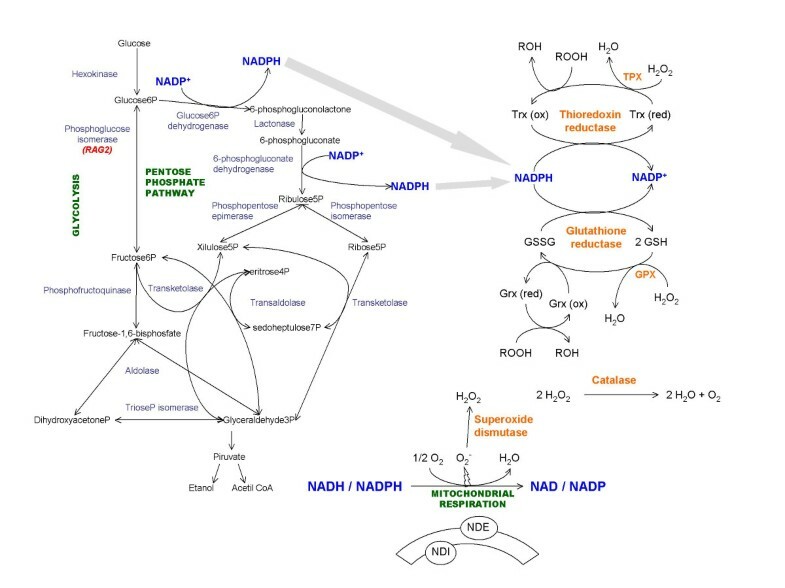 Since the oxidative stress response of S. cerevisiae includes up-regulation of genes coding for enzymes that use NADPH as a cofactor, in order to keep reduced glutathione and thioredoxin levels , NADPH-dependent stress mechanisms are a metabolic supply of oxidized NADP+ . In these conditions, the mutant yeast cells adapt their metabolism to obtain the extra NADPH needed during the stress response by redirecting carbohydrate fluxes to the PPP to the detriment of glycolysis . A recent study  has shown that the ability to redirect metabolic fluxes from glycolysis to the PPP in response to oxidative stress in order to obtain reduced coenzymes is conserved between yeasts and animals, outlining their importance in the adaptation to oxidative stress. Redox signalling might also control metabolic fluxes through enzymatic regulation. Recently, it has been hypothesized that Kl AdhI (homotetrameric cytosolic alcohol dehydrogenase I) might represent an important target in redox signalling in K. lactis cells. In vitro, there is a Kl AdhI wild-type in two reversible forms: reduced (active) and oxidized (inactive) with the Cys278 residues of each tetramer linked by disulphide bonds. Oxidized glutathione is one of the agents that inactivate the enzyme. The redox state of Kl AdhI could be a mechanism for modulating the enzyme activity directly and the glucose flux through glycolysis or PPP indirectly . In S. cerevisiae, it has been described that glucose limitation (caloric restriction) promotes a decrease in reactive oxygen species (ROS) formation and an increase in longevity that does not occur in K. lactis . The authors explain this difference by the fact that whereas S. cerevisiae shows catabolic repression of respiration (alleviated by low glucose levels), K lactis does not. These data reinforce the idea of different interrelationships between glucose metabolism and oxidative stress in respiratory or fermentative yeasts. Taking into account the above-described interconnections between metabolic fluxes and oxidative stress (Figure 1), it is possible to envisage the K. lactis model as a very fruitful system to study regulatory mechanisms affecting the oxidative stress response of a respiratory yeast and to compare them to the previously reported features for the fermentative yeast S. cerevisiae. Although data are still limited in K. lactis, we review similarities and differences already reported, or deduced from genomic comparative analysis and affecting important aspects of the oxidative stress response in yeasts. We consider the production of ROS, enzymatic reactions producing ROS detoxification, repair of oxidative damage caused in proteins and lipids and the implications of transcriptional regulators in these processes. Finally, we review related biotechnological applications, which can be exploited in a near future using K. lactis systems. Interrelationship between the oxidative stress response, sugar metabolism and redox balance in Kluyveromyces lactis. ROS are a group of molecules derived from molecular oxygen, such as peroxides, including H2O2, alkylhydroperoxides, the hydroxyl radical and the superoxide anion. ROS have toxic effects but also regulatory functions. Oxidation and reduction of thiol proteins are thought to be the major mechanisms by which ROS integrate into cellular signal transduction pathways . An excess of ROS results in oxidative stress and may eventually cause cell death. The sources of ROS are either exogenous (heavy metal ions, γ-radiation, UV light) or endogenous. The leakage of electrons from the mitochondrial respiratory chain has been described as the major source of endogenous ROS under physiological conditions, and the components of the initial and middle segments of the chain are the most active producers in this regard . The respiratory chains of the yeasts S. cerevisiae and K. lactis are characterized by the lack of complex I and the presence of three alternative NADH dehydrogenases located at the mitochondrial inner membrane. These are rotenone-insensitive and single-polypeptide enzymes that transfer the electrons to ubiquinone without proton pumping. The NADH generated in the mitochondrial matrix is oxidised by the internal alternative dehydrogenase Ndi1, while the external enzymes, Nde1 and Nde2, oxidise cytosolic NADH directly . Unlike S. cerevisiae, the external alternative dehydrogenases of K. lactis also oxidises cytosolic NADPH [23, 24]. In S. cerevisiae, ROS production by the electron transport chain was initially associated to complex III and to external alternative dehydrogenase [25, 26]. Later, it was also associated to the internal alternative dehydrogenase . Li et al. described that the disruption of Ndi1 and Nde1 in S. cerevisiae decreases ROS production and prolongs life span. However, in K. lactis, the null mutants either in the external  or internal alternative dehydrogenases do not show decreased levels of ROS when compared to the wild-type strain (our unpublished data). Although experimental data confirm a similar organization of the dehydrogenases, which allows cytosolic NAD(P)H or mitochondrial NADH reoxidation by the respiratory chain in S. cerevisiae and K. lactis, ROS production in the two yeasts differs in mutant defective from the homologous dehydrogenases. To understand this difference between structural and functional data, it is interesting to note that ROS production is not only determined by the organization of the components of the respiratory chain, but also by the relative flow of NAD(P)H re-oxidation that is achieved through the mitochondrial chain or by other systems. Several examples of these mechanisms which produce differences in relative metabolic fluxes are found. The rag2 mutant from K. lactis is more resistant to oxidative stress and produces more ROS than the wild-type strain in aerobic cultures with glucose as carbon source . Transcription levels of KlSOD1, KlCTA1 and KlCTT1, necessary for ROS detoxification, are higher in the K. lactis rag2 mutant than in the wild-type strain, when they are growing in glucose, even in the absence of an exogenously induced oxidative stress . The K. lactis mutant rag2 has to re-route all the glucose from glycolysis through the oxidative branch of the PPP and therefore, the increase in ROS production could be attributed to the higher activity of the mitochondrial external alternative dehydrogenases to oxidise the surplus of NADPH [10, 30]. The double null mutant in phosphoglucose isomerase and Nde1, the most important of the two external enzymes for NADPH oxidation, does not grow on glucose  and then a putative decrease in ROS levels in such a double mutant cannot be experimentally verified. In the rag2 mutant grown in glucose, the transcription of KlNDE1 decreases by the addition of 0.4 mM H2O2 to the medium , when NADPH-consuming mechanisms of defence to oxidative stress are increased . This transcriptional regulation also affects KlNDE2, the gene of the second K. lactis external alternative dehydrogenase using NADPH , and other genes related to active respiration, as revealed by the data obtained through the use of DNA arrays . In summary, NADPH reoxidation through the respiratory chain decreases when the NADPH-dependent oxidative stress defence reactions are up-regulated. As explained above, the blockade of electron flow by disruption of alternative dehydrogenases in K. lactis and S. cerevisiae has different consequences on ROS production. However, when the electron flow is disrupted downstream in the electron chain by the inhibitor of the cytochrome bc1 complex antimycin A, similar results are obtained in the two yeasts. In S. cerevisiae, an increase in mitochondrial H2O2 production is observed . Although there are no direct data available on the influence of antimycin A in ROS production in K. lactis, we have observed (unpublished data) that antimycin A increases tolerance to peroxide-mediated oxidative stress both in S. cerevisiae and K. lactis. This might result from the up-regulation of antioxidant defences pointed out by increased ROS levels. Eukaryotic cells have developed several defence systems against ROS. We summarize below the information available at present on some of these systems in K. lactis. The analysis of the complete sequence of the K. lactis genome, available through Génolevures , allows finding putative orthologs to S. cerevisiae genes which are related to ROS detoxification and glutathione synthesis. These include genes coding for supexoxide dismutases and their chaperones, catalases and peroxidases, glutathione and thioredoxin systems. The results summarized in Figure 2 (see Additional File 1) reveal that, in general, these genes are well-conserved in the two yeasts. Specific comments and other experimental information on particular K. lactis genes are detailed in the following sections. The systematic Génolevures nomenclature is used throughout the paper for the K. lactis sequences, synonyms are given in brackets. Putative oxidative stress response Kluyveromyces lactis sequences and their Saccharomyces cerevisiae counterparts. Similarity of the proteins (*** = highly similar ** = similar * = weakly similar). For K. lactis proteins, the cellular location indicated corresponds to the highest probability estimated by WoLF PSORT , and for S. cerevisiae proteins to the first location mentioned in SGD (Saccharomyces Genome Database); N = reference for cloning/expression of the K. lactis gene: 1 , 2 , 3 . See also Additional File 1. Superoxide dismutases (SODs) catalyze the breakdown of the superoxide radical to an oxygen molecule (O2) and H2O2. Two SODs are present in S. cerevisiae and other yeasts, a Cu-Zn containing form in the cytosol (Sod1) and an Mn-containing form in the mitochondrion (Sod2) . The active form of Sod1 is a homodimer in S. cerevisiae. Two conserved Cys of each monomer are joined together in a disulphide bond and this bond is critical for the enzymatic activity. The specific copper chaperone Ccs1 delivers the copper ion to Sod1 and also facilitates the formation of intramolecular disulphide bond . Sod2 is a homotetramer in S. cerevisiae. The specific manganese chaperone Mtm1 delivers the metal ion to Sod2, in the mitochondrial matrix . The proteins Sod1, Sod2 and their chaperones have orthologs in K. lactis: KLLA0E05567g (KLLA0E05522g) is highly similar to S. cerevisiae Sod1, KLLA0E03609g (KLLA0E03509g) is highly similar to S. cerevisiae Sod2; KLLA0F26917g is similar to S. cerevisiae Ccs1 and KLLA0A09383g is similar to S. cerevisiae Mtm1. The alignment between orthologs shows that the residues important for the activity and interaction with metallic cofactors are conserved between the corresponding proteins of the two yeasts. The sub-cellular localization predicted by WoLF PSORT  is mainly cytosolic for Kl Sod1 and mitochondrial for Kl Sod2 (Figure 2 and Additional File 1), as reported for their S. cerevisiae orthologs. In spite of the pairwise similarity in the proteins of this group, several differences between these enzymes in K. lactis and S. cerevisiae have been reported. Thus, KlCCS1 overexpression has not increased Kl Sod1 activity and a different mechanism for cation handling in Kl Sod1 has been proposed, also considering the absence of two Pro residues near the C-terminus . Other reported differences are related to transcriptional regulation. In S. cerevisiae mRNA levels of several genes of the stress response increase during hypoxia [38–40]. The response to hypoxia in this group of genes in K. lactis is low . S. cerevisiae SOD1 shows a decreased expression after a shift to anaerobiosis for up to 4 h, and then it increases to levels higher than those in normoxia . On the contrary, KlSOD1 does not show increased expression after 6 h of a shift from aerobiosis to hypoxia . Catalase breaks down H2O2 into O2 and H2O molecules using the redox properties of a protein-heme complex. In S. cerevisiae, catalase is coded by two genes, CTA1 and CTT1, corresponding to two isoforms with different subcellular locations, peroxisomal-mitochondrial matrices and cytosol, respectively [38, 41]. S. cerevisiae Cta1 is a homotetramer with a heme group and a NADP(H) one, cofactor binding sites per subunit . K. lactis orthologs are KLLA0D11660g, highly similar to S. cerevisiae Cta1, and KLLA0D14685g, similar to S. cerevisiae Ctt1 (Figure 2 and Additional File 1). Both K. lactis catalases show the typical heme-ligand signature as determined by the Motif Scan programme . In S. cerevisiae, the transcription of CTA1 and CTT1 is induced under aerobic conditions and CTT1 is also induced under several stresses [44, 45]. This transcriptional regulation is not observed in K. lactis . Although catalase activity is increased by addition of peroxides and after an aerobiosis-hypoxia shift, this increase might be attributed to post-transcriptional mechanisms . In S. cerevisiae, the effects of catalase and glutathione in defence against H2O2 overlap. Thus, the absence of catalases enhances the hypersensibility to oxidants of a strain unable to synthesize glutathione  and mutants in catalase show decreased resistance to oxidative stress [47, 48]. A similar interdependence of both systems is also detected in the rag2 mutant of K. lactis which has increased resistance to oxidative stress compared to the wild type. When catalase is inhibited by 3-aminotriazole, the tolerance to peroxide-mediated oxidative stress is reduced, and this effect is more evident when the gene encoding glutathione reductase is also deleted . Although H2O2 is a strong oxidizing agent, most of its reactions have high activation energy and are slow; H2O2 reacts directly with a few chemical groups including thiols . In catalase deficient cells, if the redox buffering capacity of glutathione is also decreased, high sensitivity to peroxides will be produced, mainly because they react with thiols from proteins, therefore altering their functions. Peroxidases reduce inorganic and organic peroxides into the corresponding alcohols using active site cysteine thiols. Two classes of peroxidases are distinguished according to the electron donor for the thiols, glutathione peroxidases (GPXs) and thioredoxin peroxidases or peroxiredoxins (TPXs); although GPXs use sometimes thioredoxin and TPXs use glutathione as electron donors [49, 50]. GPXs are classified as soluble and membrane-associated, these latter are also called Phospholipid hydroperoxide GPXs, and they reduce soluble hydroperoxides and also/or phospholipid hydroperoxides from membranes, respectively. The three GPXs described in S. cerevisiae, Gpx1, Gpx2 and Gpx3 (Hyr1), are phospholipid hydroperoxide GPXs .S. cerevisiae Gpx1 and Gpx2 are induced by glucose starvation and Gpx3 senses intracellular hydroperoxide levels to transduce a redox signal to the transcription factor Yap1p. The cellular locations of Gpx1 and Gpx3 are unknown, Gpx2 is found in cytosol and nucleus [51–54]. In Génolevures the K. lactis protein showing the highest identity with S. cerevisiae GPXs is KLLA0F06732g that shows 80% identities with Gpx3 (Hyr1), and also 75% identities with Gpx2 and 59% identities with Gpx1. The sequence KLLA0D03905g, annotated for Gpx2, shows 57% identities with S. cerevisiae Gpx2 and with Gpx3 (Hyr1) and 46% with Gpx1 (Figure 2 and Additional File 1). Besides the structural similarities between the K. lactis and S. cerevisiae genes, the transcription of orthologs is induced by oxidative stress in both yeasts. The transcription of S. cerevisiae GPX2  and the two K. lactis sequences showing similarity, mainly KLLA0F06732g, are strongly induced by H2O2 . There are five different TPXs in S. cerevisiae, found at different cellular compartments: Tsa1, Tsa2 and Ahp1 are cytosolic, Prx1 is mitochondrial and Dot5 is nuclear . The K. lactis sequences annotated for the corresponding genes in the genome database are as follows: KLLA0B01628g for Tsa1 (this protein shows also high similarity to S. cerevisiae Tsa2, 83% identities), KLLA0A07271g and KLLA0F20009g for Ahp1, KLLA0E20285g (KLLA0E20383g) and KLLA0A02651g for Prx1, KLLA0D14333g for Dot5 (Figure 2 and Additional File 1). TSA1 transcription is strongly induced by H2O2 in K. lactis . It is remarkable that, although gene redundancy is generally lower in K. lactis than in S. cerevisiae , the opposite is true for this particular group of genes. The cellular locations predicted with the highest probability for the K. lactis proteins by WoLF PSORT  coincide with the locations of the S. cerevisiae counterparts (Figure 2 and Additional File 1). This group of enzymes are proposed to be moonlighting proteins, at least in S. cerevisiae . That is, they show several functions and are able to participate in unrelated biological processes . For example, besides their peroxidase activity, Tsa1 shows chaperone activity and Dot5 takes part in the disruption of telomeric silencing [58, 59]. It has been shown that moonlighting activities are not necessarily conserved among yeast species  and, to our knowledge, there are no functional studies on these proteins that allow assigning or discarding alternative functions for these proteins in K. lactis. The two K. lactis sequences annotated as genes for the biosynthesis of glutathione are KLLA0F14058g (KlGSH1), encoding a putative Gamma glutamylcysteine synthetase that catalyzes the first step in glutathione biosynthesis and KLLA0F07557g (KlGSH2), encoding a putative Glutathione synthetase that catalyzes the ATP-dependent synthesis of glutathione from gamma-glutamylcysteine and glycine (Figure 2 and Additional File 1). In S. cerevisiae, GSH1 and GSH2 expression is induced by oxidants, such as H2O2, and by heat shock, both types of regulation mediated by the Yap1 transcription factor [60–63]. In the yeast Pichia pastoris, the genes of glutathione synthesis are also regulated by the Pp Yap1 transcription factor . The expression of the K. lactis orthologs, on the contrary, is not induced by H2O2, although KlGSH1 is one of the few oxidative stress response genes whose transcription is induced after a shift to hypoxia . In this regard,K. lactis appears different to S. cerevisiae and also to other non-Saccharomyces yeasts. The arrangement of genes from the thioredoxin and glutaredoxin systems, responsible for the repair of oxidative protein damage, shows several differences in K. lactis and S. cerevisiae as described here below. The thioredoxin system is made up of thioredoxin (TRX), thioredoxin reductase (TRR) and NADPH. TRR uses a dithiol-disulphide active-site to transfer, via the cofactor FAD, reducing equivalents from NADPH to TRXs, which are thiol oxidoreductases with two cysteines at the active site. This system, by reducing disulphide bonds, participates in the regulation of the activity of enzymes such as ribonucleotide reductase but also in protein folding and in redox signalling, this latter including transcriptional regulation of gene expression. Thus, Yap1, the transcriptional regulator of the yeast response to peroxides, is activated through oxidation mediated by peroxides and deactivated through reduction mediated by thioredoxin.S. cerevisiae contains two separate thioredoxin systems. The cytosolic system is made up of two TRXs (Trx1, Trx2) and one TRR (Trr1) and the mitochondrial one consists of one TRX (Trx3) and one TRR (Trr2) [65, 66]. In the K. lactis genome database, there is one sequence annotated as a putative gene for TRX1, KLLA0E16347g (KLLA0E16401g), and another for TRX3, KLLA0F10351g, but there is no ortholog for TRX2 (Figure 2 and Additional File 1). The thioredoxin-active site-related signature (APWCGHCK or APWCGYCQ) was also found in the K. lactis protein disulphide isomerases Kl Pdi1 and Kl Mpd1 . Two sequences in Génolevures are annotated as TRR1 genes KLLA0E21605g (KLLA0E21692g) and KLLA0F15037g. The first is highly similar to S. cerevisiae Trr1 and the second is only weakly similar. KLLA0E21605g is also highly similar to S. cerevisiae Trr2 (78% identities) and there is no other K. lactis sequence annotated as a putative gene for TRR2 (Figure 2 and Additional File 1). Between KLLA0E21605g and KLLA0F15037g, no significant alignment of proteins is produced. There are only 23% identities and the overlap includes 180 residues although the lengths of the proteins involve 350 and 298 residues respectively. The protein encoded by KLLA0E21605g shows a mitochondrial export signal of 29 residues, as predicted by MitoProt II  with a probability of 0.99; KLLA0F15037g is predicted to be cytosolic with WoLF PSORT . Among the genes of the K. lactis thioredoxin system, only KLLA0E21605g has been studied and its TRR activity has been proven [31, 69]. TRR enzymatic activity has been detected both in the cytosolic and mitochondrial fractions of K. lactis cells (our unpublished data). However, since the function of KLLA0F15037g remains to be proven hitherto, it is not possible to state whether mitochondrial and cytosolic TRRs in K. lactis are encoded by a single gene (KLLA0E21605g) or by two genes. TRRs occur in two forms, a high molecular weight enzyme such as those of mammals, the malaria parasite Plasmodium falciparum and some worms, and a low molecular weight form that is present in bacteria, fungi, plants and some protozoan parasites . The protein encoded by KlTRR1 belongs to the group of low molecular weight TRRs (homodimers, about 35 kDa/subunit) and shows their characteristic features . Mammalian TRRs have an additional C-terminal domain containing a selenocysteine residue at the penultimate position , which is absent in Kl Trr1p . Recently, the S. cerevisiae TRR structure has been solved and it shares a very similar overall structure to Escherichia coli TRR. However, fine comparisons indicate differences at the TRX recognition sites . The predicted 3D structure of Kl Trr1 is similar to the S. cerevisiae homologue (Figure 3). 3D-model of Kluyveromyces lactis thioredoxin reductase performed with PyMOL Molecular Viewer http://pymol.sourceforge.net/ (A) Domains are marked in colours. Green: FAD binding domain (residues 32-156 and 281-349). Blue: NADPH binding domain. The two Cys that make up the active site are marked in red. (B) Residues different from S. cerevisiae cytosolic thioredoxin reductase are marked in blue, these differences do not affect significantly the overall structure of the protein. The S. cerevisiae genes TRR1/TRR2 are Yap-1 targets induced by H2O2  and the same is true for KlTRR1. The addition of peroxides (H2O2 and tBOOH) increases transcription of KlTRR1 and also TRR enzymatic activity [28, 29, 31]. Besides, a consensus for Yap1p binding (ATGAATCAG at position -231 to -223) is functional in the KlTRR1 promoter, as demonstrated by the technique of promoter-lacZ fusions and beta-galactosidase activity measurements . Besides glutathione and glutaredoxins (GRXs), this system is made up of glutathione reductase (GLR) and NADPH. GRXs are small heat-stable thiol oxidoreductases using the tripeptide glutathione (gamma-glutamil-cysteinyl-glycine) as hydrogen donor. Reduced glutathione (GSH) is regenerated from glutathione disulphide (GSSG) by GLR that uses NADPH as a reducing source and FAD as a coenzyme. The S. cerevisiae genome includes eight GRXs identified hitherto, three dithiol GRXs (Grx1, Grx2 and Grx8) with the CPY/FC motif at the active site, and five monothiol GRXs (Grx3, Grx4, Grx5, Grx6 and Grx7) with the CGFS motif at the active site. Grx1 and Grx2 are located at the cytosol, a fraction of Grx2 is also present at the mitochondria, Grx3 location is at the cytosol-nucleus, Grx4 is at the nucleus and Grx5 localizes at the mitochondrial matrix. Grx1 protects cells against hydroperoxides and superoxide-radicals, Grx2 also exhibits a glutathione peroxidase activity, Grx3 and Grx4 sense the iron status of the yeast cells and regulate the nuclear localization of the Aft1 transcription factor, and Grx5 participates in the late stages of the biosynthesis of Fe/S clusters. Grx6 and Grx7 are located at the cis- Golgi and associated with the early secretory pathway. Finally, Grx8, which is localized at the cytosol, has several novel structural and mechanistic features [74–80]. GLR in S. cerevisiae is coded by a single gene, GLR1, which gives rise to a protein with a double location (cytosol and mitochondria) due to the alternative use of two translation initiation sites . In the K. lactis genome database, only four sequences are annotated as genes for GRXs: KLLA0C17842g for GRX3, KLLA0B09636g for GRX5, KLLA0E17733g for GRX6 and KLLA0B07975g for GRX8. The sequence KLLA0E24069g is annotated for GLR1. The predicted subcellular location of these proteins with WoLF PSORT  is at the cytosol-nucleus for Kl Grx3, mitochondria for Kl Grx5 and Kl Glr1, extracellular for Kl Glr6 and cytosol for Kl Glr8 (Figure 2 and Additional File 1). KlGLR1 (KLLA0E24069g)  is the only gene experimentally studied from this system in K. lactis so far. Overexpression of the KlGLR1 gene in a multicopy plasmid, under the control of its own promoter, causes an 8-fold increase in GLR activity when compared to wild-type levels . Moreover, a null mutant in the KlGLR1 gene shows no glutathione reductase activity . Although this result confirms that KlGLR1 is the only gene that encodes a functional glutathione reductase in K. lactis, GLR activity is present both in mitochondria and cytosol (our unpublished data) suggesting a possible mechanism of sorting to mitochondria. S. cerevisiae Glr1 is a dimeric flavo-oxidoreductase whose structure has been solved . The overall structure and the active site are conserved in the E. coli and human homologues but differences are found at the interface of the monomers, mainly in the region of the N-terminal domain that contributes to the formation and stabilization of homodimers. The protein encoded by KlGLR1 exhibits a similar predicted 3D structure and distribution by binding domains (Figure 4). The N-terminal FAD-binding domain contains a glycine-rich motif GXGXXG/A involved in the binding of the coenzyme and a redox-active disulphide, necessary for electron flow between NADPH and oxidized glutathione via FAD. The central NADPH-binding domain also contains a glycine-rich GXGXXG/A motif but with residues, distinctive for specific interaction with NADP(H). The C-terminal domain makes up the interface between subunits in the dimeric proteins . 3D-model of Kluyveromyces lactis glutathione reductase performed with PyMOL Molecular Viewer http://pymol.sourceforge.net/ (A) Domains are marked in colours. Blue: dimerization domain. Yellow: NADPH binding domain. Red: FAD binding domain. The arrow points out the disulphide bridge that makes up the catalytic domain (B) Residues different from S. cerevisiae glutathione reductase are marked in blue, these differences do not affect significantly the overall structure of the protein. In K. lactis, Glr1 regulation does not respond to peroxide treatment, neither by changes in mRNA transcription of the KlGLR1 gene nor by enzymatic activity modulation [28, 29, 31], whereas S. cerevisiae Glr1 is an oxidative stress-defence inducible enzyme and its gene is a Yap1p-target [83, 84]. In spite of the lack of induction of KlGLR1 by peroxides, the influence of Kl Glr1 in oxidative stress resistance is inferred from the fact that the tolerance to H2O2 of the rag2 mutant decreases when the KlGLR1 gene is deleted and also because overexpression of KlGLR1 increases tolerance to H2O2 . In addition to their participation in oxidative stress defence, TRR and GLR activities also contribute to the reoxidation of the surplus of cytosolic NADPH produced in the PPP in K. lactis, although to a lesser extent than other mechanisms recently reviewed . This could be regarded as a functional difference between these enzymes in K. lactis and S. cerevisiae. As explained above, the K. lactis rag2 mutant growing in glucose (re-routing this sugar through PPP) or fructose (glycolysis) produces different NADPH cytosolic levels. When the K. lactis rag2 mutant grows in glucose, there is a transcriptional gene induction of the external alternative dehydrogenases if compared with mRNA levels obtained for the rag2 mutant growing in fructose or the wild-type strain growing in glucose. This induction is necessary for rapid NADPH reoxidation by these enzymes and it is lowered after treatment with H2O2, i.e. after induction of the NADPH-consuming defence mechanisms against oxidative stress, and specifically TRR [23, 29]. The comparison of GLR activity in the K. lactis rag2 mutant growing on glucose vs. fructose and vs. the wild-type strain shows a small but significant increase [10, 28] that is not shown at a transcriptional level [29, 31]. To test the relative importance of these enzymatic activities, external mitochondrial dehydrogenases vs. TRR or GLR, for NADPH reoxidation, it was also assayed whether the impaired growth on glucose of the rag2 mutant when the respiratory chain was blocked, either by Antimycin A or by hypoxia, could be restored by means of increasing TRR or GLR activity. The result was negative in both assays . The rag2 mutant does not grow under hypoxia in spite of the hypoxic increase in KlTRR1 expression and enzymatic activity in the rag2 mutant, compared to the wild-type strain  and it does not grow on glucose with Antimycin A even if KlTRR1 expression is induced by peroxide treatment . In a similar way, KlGLR1 overexpression does not restore growth on glucose of the rag2 mutant when the mitochondrial reoxidation of cytosolic NADPH is blocked by Antimycin A . The role of GLR activity in cytosolic NADPH reoxidation is supported by the remark that the expression of the KlGLR1 gene, under its own promoter in an episomal plasmid, completely restores the growth on glucose of the S. cerevisiae pgi1 mutant . In S. cerevisiae and other organisms, GLR has been reported to regulate the activity of glucose-6-P dehydrogenase by controlling the NADP+/NADPH ratio through redox interconversion of glutathione . In fact, the increase of GLR activity in the K. lactis rag2 mutant is positively correlated with the glucose-6-phosphate dehydrogenase (G6PDH) activity that produces NADPH and it is also positively regulated by an active respiratory chain . Moreover, to support further the role of GLR in cytosolic NADPH reoxidation in K. lactis, the growth on glucose of the double null mutant ΔKlglr1Δrag2 is improved in comparison with the rag2 strain. This was attributed to the deviation of NADPH from GLR to the mitochondrial dehydrogenases. Thus, more energy is obtained, since the reoxidation of the NADPH from the PPP by mitochondrial external dehydrogenases yields ATP but the reoxidation by GLR does not . The glutathione transferases (GSTs) function as detoxifiers of electrophilic compounds such as xenobiotics, anticancer drugs, heavy metals or products of oxidative stress by conjugating them to GSH and excreting the GSH-conjugated molecules with improved solubility. Structurally, GSTs belong to the thioredoxin-fold group. In S. cerevisiae there are two standard GSTs (Gtt1 and Gtt2), which overlap functionally with Grx1 and Grx2. Gtt1 is associated to the endoplasmic reticulum and Gtt2 is mitochondrial [86, 87]. Also, S. cerevisiae contains three omega-class GSTs (Gto1, Gto2 and Gto3), which are not active against standard GSTs substrates but are active as thiol oxidoreductases (GRXs). They make up a mixed disulphide between GSH and a N-terminal Cys of the GST molecule. Gto1 is peroxisomal, Gto2 and Gto3 are cytosolic [52, 88]. The K. lactis genome database contains two sequences annotated for GSTs: KLLA0A00264g is highly similar to S. cerevisiae Gtt1 and KLLA0F12056g is similar to S. cerevisiae Gto2. KLLA0F12056g also shows 55% identities with S. cerevisiae Gto3. The sub-cellular localization predicted by WoLF PSORT  is mainly mitochondrial for Kl Gtt1 and nuclear for Kl Gto2 (Figure 2 and Additional File 1). Since no further information is available on these genes in K. lactis, the comparison with the situation in S. cerevisiae is waiting for future experimental data reports. In S. cerevisiae the Yap1 transcriptional factor (for yeast AP-1 factor) is the major regulator of the oxidative stress response. It was initially observed that the Δyap1 deletion mutant is hypersensitive to peroxides, H2O2 and t-BOOH, and also to chemicals which generate superoxide anions. These latter include menadione, plumbagine and methylviologen. Δyap1 is also hypersensitive to cadmium, methylglyoxal and cycloheximide. Yap1 is therefore central to the adaptive response to oxidative stress, regulating not only the response to H2O2-induced stress, but also that to chemical oxidants (redox cycling chemicals, thiol oxidants and alkylating agents), cadmium and drug stress [89–91]. In S. cerevisiae, the Yap family of b-ZIP proteins comprises eight members (Yap1-Yap8) with a significant sequence similarity to the yeast factor Gcn4 at the DNA-binding domain . The Yap family is involved in a variety of stress-related programmes, including the response to DNA damage and oxidative, osmotic, and toxic metal stresses. The members of the Yap family carry out overlapping but distinct biological functions. YAP2 overexpression confers resistance to cadmium, cerulenin and 1,10-phenanthroline, among others  and the yap2 null shows decreased resistance to oxidative stress and 5-fluoruracil http://www.yeastgenome.org/cgi-bin/locus.fpl?locus=YAP2. Yap4 and Yap6 are the Yap family members which share the greatest similarity at the protein level, showing almost 33% identity between them . YAP4 is induced under hyperosmotic stress and regulated by Msn2 in a Hog1-dependent way via the STRE element present in the upstream promoter region . In S. cerevisiae, resistance to arsenic is achieved through the activation of the arsenic compounds-resistance (ACR) cluster , which is made up of the positive regulator Acr1 (Yap8), the arsenate-reductase Acr2 and the plasma membrane arsenite efflux protein Acr3 . The YCF1 (yeast cadmium factor) gene encodes an independent detoxification system that also sequesters arsenic into the vacuole [95, 96]. Induction of the expression of ACR2, ACR3 and also YCF1 by the transcription factor Yap8 is essential to arsenic stress response . Besides, Yap1, 2, 4, 5, and 6 have been related to the cellular response to methylmethanesulfonate (MMS), a DNA alkylating agent [98–104]. To sum up, functionally, Yap1 is the major regulator of oxidative stress, Yap2 of cadmium stress, Yap4 and Yap6 of osmotic stress and Yap8 of arsenic stress  in S. cerevisiae. There is also evidence of cross-talk between Yap members. For instance, the yap1yap2 double mutant is more sensitive to oxidative stress than either single mutant alone, as the yap1yap8 double mutant is to arsenic stress . After sequencing the K. lactis genome, the ORF KLLA0A01760g has been proposed as the YAP1 ortholog and KLLA0D14399g as the YAP5/YAP7 ortholog . We have carried out an extensive study of the K. lactis genome looking for Yap homologues. Additional File 2 shows the identities found between the S. cerevisiae Yap family and several K. lactis ORFs using Bl2seq alignment http://blast.ncbi.nlm.nih.gov/Blast.cgi between related proteins from K. lactis and S. cerevisiae. The Skn7 transcriptional factor, related to oxidative stress response [106–108] has also a homologue in K. lactis, KLLA0A10219g. S. cerevisiae Yap1 and Yap2 are closely related to KLLA0A01760g and might be derived from a common ancestor. In this regard, experimental data have shown that the KlYAP1 gene (KLLA0A01760g) is able to complement in S. cerevisiae both yap1 and yap2 mutations . Besides, gene disruption experiments in K. lactis indicate that the KlYAP1 gene is involved in both the oxidative and cadmium response pathways . Data from Additional File 2 show that KLLA0B13695g is more closely related to Yap3, KLLA0E16875 to Yap4 and Yap6, KLLA0D14399g to Yap5 and Yap7 and KLLA0E00265g to Yap8. Using the alignments of the bZip domains, the cladogram (Figure 5) shows also the same relationship between S. cerevisiae and K. lactis genes. This suggests that, after genomic duplication [110, 111]Saccharomyces-yeasts evolved by increasing the number of the Yap family of b-ZIP proteins. Figure 6 shows the conservation of the basic region and Leu zipper in the bZip domain of the KlYAP genes as well as positional coincidence of the domain in the topology of orthologs from K. lactis and S. cerevisiae. Experimental data on the function of these genes in K. lactis are necessary to clarify whether there is some functional specialization of these transcriptional factors related to specific forms of stress as previously reported in S. cerevisiae. Cladogram showing the phylogenetic relationships between the Yap factors from S. cerevisiae and K. lactis orthologs. Distances are indicated after the protein or ORF names. In S. cerevisiae, Yap1 is activated upon exposure to oxidants by a mechanism which acts on its subcellular protein localization. In non-stressed cells, rapid nuclear export of Yap1 prevents its nuclear regulatory function. The Yap1 nuclear export signal (NES) is embedded in a Cys-rich domain located at the C-terminal part of the protein (C-CRD). There is another Cys-rich domain in Yap1, located at its N-terminus (N-CRD). Transitional redox conformation is converted into Yap1 due to the intramolecular reorganization of Cys disulphide bonds which cause NES or hidden exposition. Activation by increased levels of ROS requires both the C-CRD and N-CDR centres, while response to thiol reactive chemicals requires only C-CRD [50, 112–118]. 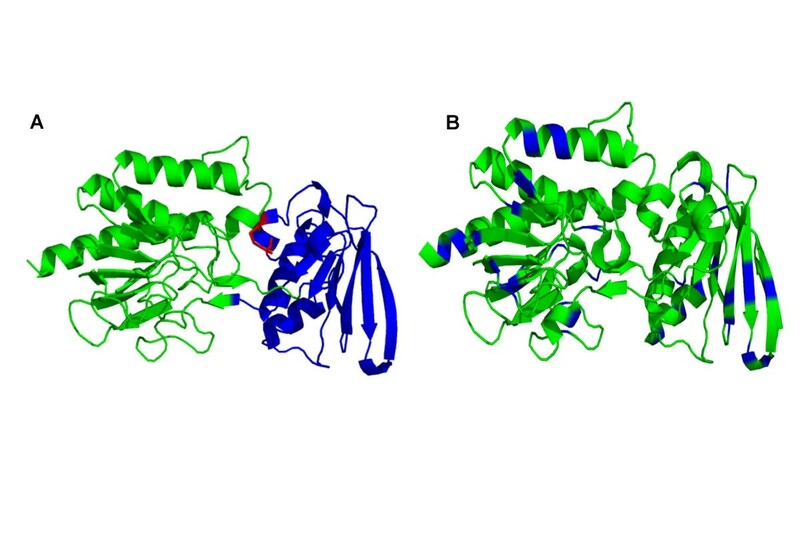 In Kl Yap1 there is a good conservation of Cys residues and the NES signal embedded in the C-CRD and two Cys from the N-CRD are also conserved (Figure 6). Therefore, the existence of mechanisms for redox-regulation of Kl Yap1 cellular location by ROS and thiol reactive chemicals is predictable. We have explored the K. lactis genome looking for orthologs of the necessary partners of Yap1 for this regulation, Orp1/Gpx3, Crm1 and Ybp1. Orp1 is a thiol peroxidase (Gpx3) that functions as a hydroperoxide receptor to sense intracellular hydroperoxide levels and transduces a redox signal to the Yap1 transcription factor . Ycb1 is a protein required for oxidation of specific Cys residues of the transcription factor Yap1, resulting in the nuclear localization of Yap1 in response to stress . Ybp2 has a significant role in resistance to oxidative stress and has a sequence similarity to Ybp1. KLLA0F06732g has 80% identity to Gpx3. KLLA0E16061g has 86% homology to Crm1. KLLA0C05698g has 50% homology to Ybp1 and 50% homology to Ybp2 but only one gene is present in K. lactis. Alignment of the N-CRD and C-CRD domains of S. cerevisiae Yap1, Yap2 and K. lactis Yap1. Besides the Yap family of transcription factors and their effectors discussed above, we have recently found that the transcriptional factor Kl Hap1, which in S. cerevisiae controls the activation of respiratory genes during aerobiosis and has unknown functions during anaerobiosis , in K. lactis it is involved in the oxidative stress response. Transcriptional expression of KlHAP1 is dependent on oxygen availability, increasing its expression in hypoxia. Deletion of KlHAP1 increases the resistance to oxidative stress or cadmium tolerance. Moreover, the induction of KlYAP1 and KlTSA1 after the addition of 0.5 mM H2O2 is repressed by Kl Hap1 . This repressor effect of Kl Hap1 might be physiologically important in the context of a very active respiratory metabolism in K. lactis, prone to producing oxidative damage. The negative effect of Kl Hap1 on KlYAP1 and KlTSA1 expression would serve to attenuate this response. It has been reported that the KlHAP1 disruptant shows temperature-sensitive growth at low glucose concentration and that Kl Hap1 represses the expression of the major glucose transporter gene RAG1 . The dual control of Kl Hap1 over the glucose transport, conditioning the respiro-fermentative metabolism of the cells, as well as over KlYAP1 and KlTSA1 is a new clue about the close interrelationship between control of metabolic fluxes and oxidative stress response. Differential production of ROS or response to oxidative stress in yeast species or strains from the same species has not only a scientific interest but also biotechnological implications in several fields. One of these fields is the use of yeasts as cell factories. K. lactis is one of the most important non-Saccharomyces yeasts used as a host for heterologous protein production . In K. lactis, an increased amount of ROS is present in cells expressing high levels of heterologous proteins. This fact plays an important role in the limitation of recombinant protein production which has to be overcome by using engineered strains with increased ROS detoxification mechanisms, for example by overexpression of KlSOD1 . K. lactis is able to metabolize the milk sugar lactose, for this reason the whey obtained as a by-product of cheese making is a suitable substrate for the culture of this yeast and heterologous protein production. The K. lactis transcriptome in synthetic and cheese whey media was compared by DNA-array analysis and it was found that several genes related to GSH metabolism and oxidative stress response are over-expressed in cheese whey; these include KlGLR1 (KLLA0E24112g), KlGRX3 (KLLA0C17842g), KlCTA1 (KLLA0D11660g), KlSOD1 (KLLA0E05522g), KlGRX5 (KLLA0B09636g), KlCTT1 (KLLA0D14685g) and KlYHB1 (KLLA0B14476g) encoding a nitric oxide oxidoreductase, a flavohemoglobin involved in nitric oxide detoxification that plays a role in oxidative and nitrosative stress responses. Moreover, the groups of genes of protein glycosilation and post-translational processing are also differentially expressed in the two media. These data give support to the reports on the benefits of using cheese whey and K. lactis for heterologous protein secretion . Some yeast strains are used to ferment sugars into fuel ethanol or beverages. It has been shown that hypoxic fermentation in media containing high concentration of sugar causes stress conditions, which results in the production of ROS and triggers an antioxidant response, as well as in the fact that the ROS scavenging ability is involved in the maintenance of the fermentative ability of yeast strains used in industrial processes . Glutathione has several uses in pharmacology, cosmetics and food industries, and companies are interested in producing it. Some yeast strains, such as S. cerevisiae and Candida utilis, are currently used for fermentative glutathione production on an industrial scale. Improved yields have been obtained by optimizing the culture media and conditions, through mutagenesis and by overexpression of the genes of glutathione biosynthesis, mainly GSH1 that catalyzes the limiting step [125–129]. In K. lactis, it has been described that GSH homeostasis is linked to the flocculation mechanism and a possible biochemical regulation of lectin expression by GSH levels in cells has been postulated . This characteristic could be exploited in biotechnological processes, for example, some disinfection procedures use oxidants that influence GSH homeostasis and therefore the degree of microorganisms aggregation which, in its turn, might be involved in partial deficiency of such disinfection procedures . Whereas S. cerevisiae is a fermentative yeast considered the eukaryote model for studies on oxidative stress, K. lactis is a respirative yeast that emerges as an alternative model. The knowledge about the oxidative stress response pathways in K. lactis is hitherto little if compared with S. cerevisiae but the full genome sequences of both yeasts are available and studies based on sequence homology can be performed. This approach suggests that the same pathways of the oxidative stress response are present in both yeasts and that genes are generally conserved. However, several functional differences have appeared and they have been attributed to differences in their respiro-fermentative metabolism. These differences constitute new promising research fields and applied biotechnological implications are also envisaged. Recent research in the authors' laboratory was supported by grant BFU2006-03961/BMC from MCYT (Spain) co-financed by FEDER (CEE). General support to the laboratory during 2007 was funded by "Programa de axudas para a consolidación e a estruturación de unidades de investigación competitivas do sistema galego de I+D+I co apoio da Consellería de Innovación e Industria" (Xunta de Galicia). MEC was sponsored during 2007 by the "Programa de promoción da intensificación da actividade investigadora no sistema universitario de Galicia co apoio da Consellería de Educación e Ordenación Universitaria" (Xunta de Galicia). General support to the laboratory during 2008-09 was funded by "Programa de axudas para a consolidación e a estruturación de unidades de investigación competitivas do sistema galego de I+D+I co apoio da Consellería de Educación e Ordenación Universitaria". MEC and MIGS conceived of the study and participated in its design and coordination, performed the literature review and drafted the manuscript. Some results in references cited and unpublished, from the authors' laboratory, are part of the PhD works of NT and AGL. NT conceived and depicted Figure 1. AGL contributed to the construction of the models depicted in Figures 3 and 4. All authors read and approved the final manuscript.